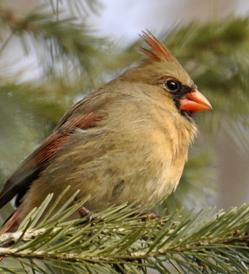 Wild Bird Feeding | Faddegon's Nursery, Inc. Through October 20th, 2015 our Feathered Friends Wild Bird Food Advance Order Sale is in effect. Get the lowest prices of the season now and stock up for the winter! Just come in and order now and we’ll contact you when the seed arrives. Many people feed birds all year-round, not just for the birds sake, but to enhance the chances for great birdwatching right around the home. Are summer feeding and fall feeding different in any way? It’s an old myth that once you start feeding birds, you mustn’t stop. Birds will find food. Quickly! Adding fruit and nuts to the bird feeding menu is also very helpful in fall. As berries and other sources disappear with plants going into dormancy, birds will love some of these nutrient rich foods. Low quality foods contain a lot of fillers and seeds that birds don’t care for. They know the difference just like us! They’ll let you know pretty quickly if the food you’re providing doesn’t meet their needs for high-energy nutrition.